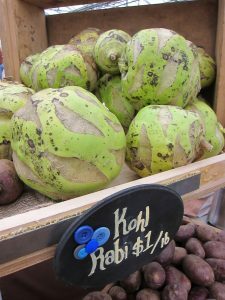 I am sure some of you have spotted a knobby round veggie called kohlrabi at the fall or winter farmer’s market and thought, “That sounds AND looks strange.” I need to be honest and say that at first, I was a bit intimidated by this strange looking veggie. But there is nothing to fear! Kohlrabi is from the cabbage, brussels sprout and kale family- so I knew it had to be good! Kohlrabi has a taste between broccoli stem and cabbage, with a hint of spicy radish, but when cooked it gets sweeter. 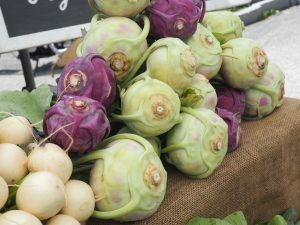 Don’t be confused if you see kohlrabi looking different every time you visit the market, they can be purple, green or white. Typically, kohlrabi is sold at the farmer’s market as only the bulbs, but if you happen to see any with the greens still attached, grab them! The leaves are loaded with iron and can be eaten in a salad or steamed. The kohlrabi is a great source of potassium, fiber and vitamin C &B6. To cook kohlrabi, use a vegetable peeler to peel the tough skin and then slice into cubes, slices or sticks. Kohlrabi is super versatile and can be used in a variety of ways, depending on what you’re feeling that day! You could add uncooked thin slices of kohlrabi onto a salad, use the sticks for dipping sauces (check out the yogurt dip below), roast with butternut squash for a winter side dish, shave it into a slaw, or my favorite: fries! Kohlrabi is also eaten mashed as a potato substitute and is good pureed in soups as well. Try this spicy kohlrabi fry recipe as a snack or a side! Wash the kohlrabi and with a sharp knife, cut into thin strips. In a bowl, combine the kohlrabi, olive oil and spices. Mix well. Spread the kohlrabi on a baking sheet in a single layer. Bake for 25 minutes flipping once, until they are soft and dark on the outside. Kaidy’s Post: Blueberries, a superfood?